Would you believe we are now preparing for ANOTHER record snowstorm here in Chantilly, VA?!?! 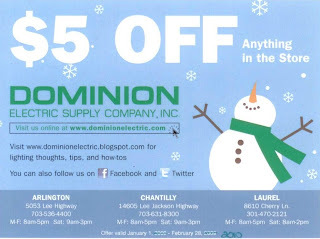 So I thought it would be another good day to share our cute little snowman coupon! I think they're still saying we may get 2-3 FEET of snow, so we should have plenty of the stuff around to build entire families of snow men, women, and children! So just print out this coupon and bring it into any of our 3 showrooms for your $5 off anything in our stores!